Flying or long road trips can be scary for some, especially parents of little boys who do. not. stop. moving!!! Like a boy scout, preparation is key when getting psyched up and sorted for a long haul flight. After careful consideration of stuff that isn’t noisy, will not roll down the airplane or fall into a thousand tiny pieces under the seats. The major tips – are think small, think compact, think quiet, think minimal mess, keep it simple and contain it. This is the inflight entertainment kit I’ve thrown together for my 20 month old. Drawing stuff and a pencil case to store it all in. I picked up a sketch book and these cool crayons from the local news agency. They look fun and should be nice and easy for little hands to hang onto. The big upside for me – 3 pieces and 18 colours. Happy Days! I’ve also thrown in the stickers from the bottom of the weetbix. Magnetic Playbook – I’m not entirely sure he’ll be into this, but happy to give it a go. It packs flat and folds out to a blank scene that you can add the animals and other jungle bits too. I’m sure the other passengers will get a few animal sounds (elephant and lion are the current fav’s) but hopefully no crying. The other upside is being magnetic, it’s a bit like reusable stickers. Water wow book. We have a big one of these at home and my son loves it. Essentially you fill a brush up with water and paint it over a picture. As you paint the colours of the pictures show up. As the book dries, it goes back to white so you can use it over and over. The only risk on this one is someone getting a bit wet if the pen leaks. Board Book – Giraffes can’t dance or where do diggers sleep at night most likely, but they’ll go in on flight day. Something smallish with detail in the pictures! Last but not least, an ipad loaded with Playschool, Baby Jake, Peppa Pig goes on holiday movie and a bunch of toddler friendly games. I’ve bundled the whole lot up into a wet bag, which I figure will contain the fun and also be handy at the other end, if for some reason I need to pop some wet or soiled clothes in a bag. I have packed back up snap lock bags. I also like the idea of knowing where the entertainment is when I’m rummaging around inflight and trying to keep it all together. We’re heading to NZ on this trip so it’s a cool 3 hours, so it’s pretty light on and I’m hoping will do the trick, we’ll use these throughout the trip as well, although hopefully he’ll have such a great time we can shelf the toys for the flight home haha… Thinking about it, I’m not sure I’d take much more on a longer trip! Lots of snacks. I’ve tried to pick stuff that won’t be too messy and will take a while to eat – ie lots of smaller pieces to pick up. I do have a snack container with a spill proof lid to try and minimise the mess. Spare dummy and lanyard, my boy uses a dummy as a comforter. After having dropped a few on gross plane carpet before, I’m a happier mum pinning them on and saving them from the depths of the airplane floor. Spare change of clothes for him and me. In my google and pinterest research (I’m not alone right! ), I read alot about mums who individually wrap new toys and bring out one piece of entertainment per hour. On a longer flight I think this is a great idea, although I do wonder if it would end in a tantrum wanting all the presents now. I also read about a mum who makes two inflight kits – one for the way there and one for the way home – genius and I wish I could be bothered being that organised! There are so many amazing ideas out there on what to pack for little people and so many clever mums who make them. I can see a laminating machine in my future to create eye spy sheets and other random games. I read a great article (That I can’t find the link for now sorry) that had one mum gifting home made travel kits to all her kids friends. It was essentially a ring folder with a bunch of zip lock files containing games like eye spy, colouring templates that were laminated so the kids could colour them with wet/dry or wipe off markers or something I’ll find out about in years to come, magnetic fishing – I was trying to get my hands on one of these but they seem to be out of stock everywhere. With a bit of time I would’ve picked up some flashcards on a ring, a matchbox car or two and perhaps a wind up animal to make jump on the tray table, but out of time so noting it here for the next trip! Perhaps by then I’ll have the two part system sorted. I’d also try and be a bit more organised and shop online, I found some gorgeous stuff online at Hello Charlie but was too late for delivery so picked up most stuff from toys at home, the local toy store and newsagent. On the short list – but it didn’t make the cut – wooden fruit. It’s just too bulky. We’re in kitchen phase, where everyone gets given wooden food to eat – so cute, but not travel friendly on limited space. Animal Snap – he loves it, but I have visions on trying to collect a deck of animal cards from all over the plane, this is where the ring cards would’ve been great. Life’s about the journey and if you can keep your wee one happy on a plane, it’s a much happier journey for all involved. Happy Travelling, wherever your adventures take you. 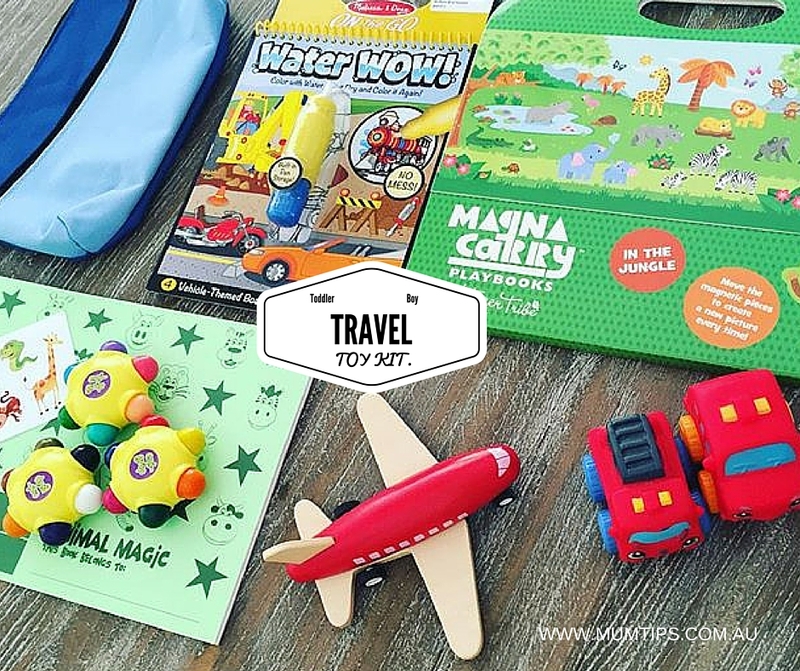 What do your little ones love playing with when they travel?